Any other private, non-profit organization that provides “public services” including public health, early childhood organization, public interest law, among others. On federal student loans, after 10 years (or 120 on-time monthly payments), any remaining balance is forgiven. Doesn’t have to be continuous (ie 2 years of AC, then 5 years of for profit, then 8 years of non-profit qualifies). 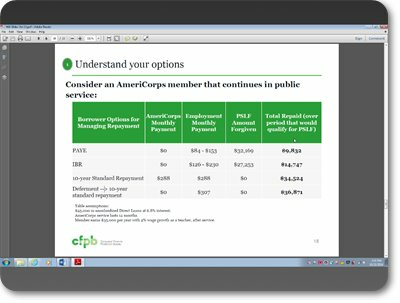 AmeriCorps service qualifies but members must have income-based repayment plan (or otherwise making monthly payments) during service. For very low-wage workers, a monthly “payment” can be as low as $0. Which loans qualify for PSLF? How do I get on an income-based repayment plan (IBR)? Enroll in IBR at www.studentloans.gov . The earlier you can enroll in IBR, the better! Also check with your loan servicer initially, then annually to make certain you are on track. Are there any other steps I need to take? You and your employer must sign a certification form each year. I’m not sure I’ll spend 10 years in the public service sector. Is this something I should worry about? It is recommended that those who are not likely to continue in public service sector should still enroll in IBR plan to maintain possibility of PSLF. Any service after October 1st, 2007 can count retroactively. Look for an action guide and other tools available soon! 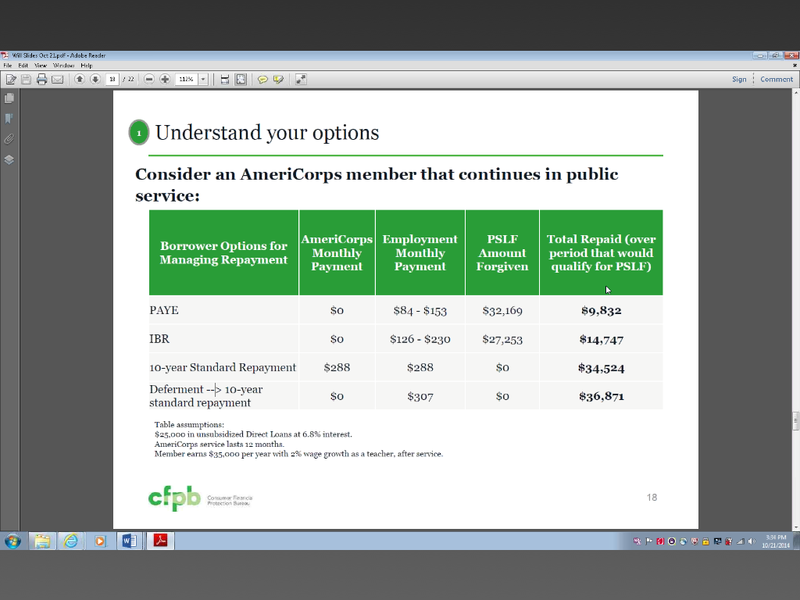 How does this compare to other repayment plans?